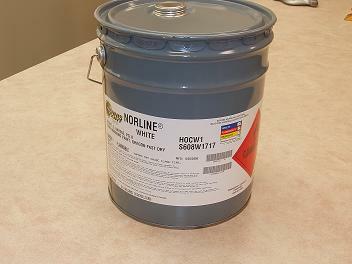 HOCW1 White and HOCY2 Yellow | Alpine Products, Inc. These paints meet the State of Oregon Standard Specification for Highway Paint Bead Binder White and Yellow. These durable traffic markings paints have passed the physical and road wear test requirements for the State of Oregon according to revision 77-100-6800 white, and 77-100-6800 yellow. Uses: Road, parking lot, and general purpose striping. A. At 10 degrees C (50 degrees F) 95 KU max. C. At 50 degrees C (122 degrees F) 70 KU min. 3. Stability no gelling, settling, skinning, or discoloration for 6 months. 4. Cry time – dry to no pick-up 5 minutes lab test. 5. Weight per gallon – within +/- 0.2 lbs. of test sample. 6. Road service test – as specified by state. These beaded lines are applied by the state annually for approximately a 6 month period and evaluated for wear. 7. Color – Paints meet Federal Standards for white and yellow, Federal Standards 37875 (white), 33538 (yellow). 1. Vehicle or resinous binder compostion. The vehicle may be any combination of natural or synthetic resinous materials. However, all resins must be permanently capable of re-dissolving in the solvent combination used in the paint. 2. Pigment requirements shall be medium chrome yellow (lead chromate) for yellow paint, titanium dioxide for white paint contains no lead compounds. 1. These paints may be applied with air or airless equipment and are intended to have reflective glass beads dropped on to the wet film immediately at the time of application. Bead application should be 4 to 6 lbs. beads (type A) per gallon of paint. 2. Cleanup and thinning, if required, should be done with Toluene.